US Coast Guard commander and Major General Kostelnik, chief of Office of Air and Marine. In recent years, major military contractors have dominated DHS' top 25 contractors. In 2011, for example, the leading DHS contractors included (in descending order) Raytheon (ranking No. 1), Northrup Grumman, Lockheed Martin, SAIC, European Aeronautical Defense and Space Company, SAFRAN, L-3 Communications, Booz Allen Hamilton, General Dynamics, and Defense Support Services. Since DHS began operations in 2003, Boeing - notorious in the border security context for being the prime contractor of the mightily flawed "virtual fence" - has been the single largest DHS contractor, with more than 800 DHS contracts amounting to a cumulative $86.4 billion in homeland security contracts. Boeing follows Lockheed Martin as the top DOD contractor. Money is what fuels the military-industrial complex. 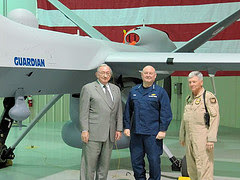 Yet in probing DHS's close relationship with General Atomics and the department's persisting commitment to aerial surveillance by military-grade drones, more than dollars are at work. CBP's successive choices of two retired major generals to direct OAM point to DHS determination to reorient traditional border control operations into a strategic military framework. What is more, the choice in 2005 of retired Air Force Major General Michael Kostelnik to direct the newly created Office of Air and Marine, followed by the choice of retired Marine Major General Randolph Alles to succeed Kostelnik in January 2013 signaled the CBP's conviction that UAVs should play a central role in continuing the post-9/11 missions of "homeland security" and "border security."